Week 24 Update: November 26th, 2013 - Half-way point - I'm at the summit...of my training. I am slowly crawling back into swimming shape after a few weeks off. Doubt I will do much more than just get somewhat fit because my workouts from this point forward need to be more focused on climbing exercises (e.g., running, bike, lifting, and elliptical) and less focused on non-climbing (swimming). It is great to be back in the water though. Had a few great runs last week and I feel fantastic - even held 5:40 mile pace for 30 minutes. I am starting to feel really fit. Once the next two weeks pass, I can concentrate more on hypoxic acclimatization. 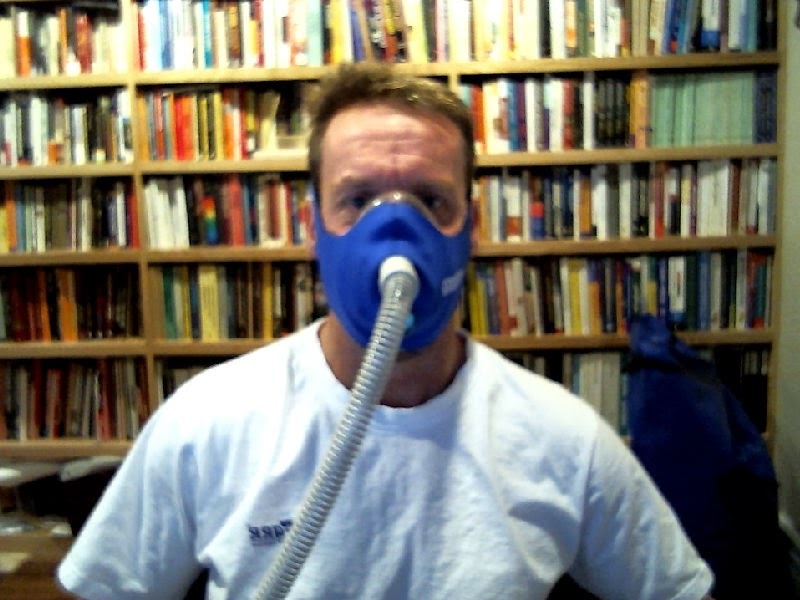 Speaking of hypoxic acclimatization, my colleagues and I submitted a grant proposal to collect data on Everest. Fingers crossed that we get the grant and contribute to the scientific literature on hypoxia adaptation. More on that topic later in subsequent post. Learned another valuable lesson about stress. Every stressor adds up whether it is from work, life, training, or something else. Stress is stress. I had a huge amount of stress last week and yet I managed to still train and avoid getting sick. How did I do it? I slept long and well. When things got really bad at the end of the week, Kathy and I skipped the tent at night to ensure we both recovered. Oh yeah, stress also transfers from one partner to another. Last week was my work stress and I am sure Kathy felt a good bit of it - not through my behaviors but by my constant griping about insanity at work (and I mean insanity). This week is another week and due to the Thanksgiving break, I get a break. Slowly you will see the figure below change as I move away from swimming and toward biking, running, and training on my elliptical. I foresee a ton of movies in my near future. Anything to pass the time away while I toil on those stationary machines. Any suggestions? Last week was a week of bookends. I had huge days on Sunday (day 1 of my training week) and Saturday (last day of my training week) where both were in excess of 4.5 hours. Despite the high workload and relatively high intensity, I felt great and continue to recover well. The middle of the week was slightly shorter with a mixture of low intensity and some intervals. I decided to cut back a bit on both duration and intensity because of work-related stress. Two more weeks….two more weeks. Yeah! I am looking forward to that full week off. Not sure what I will do with the extra 20 hours. Perhaps I will sleep. I fixed the figure below to accurately reflect the timing. Somehow or another, I messed up the simple arithmetic and had next week as a rest week. Just ask my swimming mates; counting ain't my strong suit. I know all sorts of complex math but I cannot count. Strange but true. I slowly crept over the 400 hour mark and am now officially half-way to my 800 hour planned total. Half-way is similar to the summit. As many mountaineers say, the summit is half-way. Well, I'm half-way on my training. The next half will likely require the same attention that a descent requires. 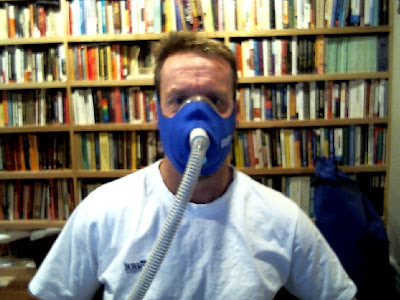 Stay tuned for more updates about my hypoxic training schedule. Out of the survival mode and into full recovery mode. Since November 1st, Kathy and I skipped 7 days of tent sleeping. That gives us only 18 days out of 25 - not bad but we might want to stick to 9000 feet more frequently later on in our acclimatization routine. Those skipped days, however, were real blessings. Without proper recovery, I know we both would be sick right now. When I was working on my masters degree in exercise and sports science, I had an awesome professor (Jean Williams) who always said that the three greatest stressors in life were clocks, calendars and completion times. Well last week I had all three in spades. My days were so packed that I watched the clock constantly to make sure I could get the tasks I needed to get done each day while also slipping in a few workouts. If I could clock 19.5 hours last week, I could easily workout that much when school is not in session. Heck, I might even be able to do twice that number. Second thought, I think I would prefer to sleep and recover from 20 good hours of training. My calendar constantly beckoned me to get more done…with what time I had no idea. A friend and one of my former classmates Traci Riccitello posted this great article I mentioned previously but I have a slightly different view about the word busy now. Sometimes, we are really busy. Sometimes, we are just inefficient and that inefficiency makes us busier than we ought to be or rather creates the impression of being busy. Other times, we are so stressed that we cannot move forward and the word “busy” is a euphemism for “stressed out.” I am not sure what I was last week - perhaps all three but my calendar kept telling me that I had more things on my plate that I did not recall. Again, counting is not my strong suit. Finally, completion times are a crusher. There are rare instances in my life when I really have completion times but last week I had several. A dissertation defense (well done Jane Barrow! ), thesis defense (another well done to Liz Berke! ), and an honors proposal defense (three cheers Charlie Bare!) fell on the same week as a grant proposal was due (11/22/13) and a faculty evaluation for promotion to full professor. Each of these consumed what little free time I had to prepare for my classes, finish my own research, finalize two contracts, and submit bills for each. Yep, a busy week and I was in the zone. Perhaps that zone was a fog but I got it all done. Missed a few hours of sleep but got everything done and, I hope, with sufficient quality that I get a funded grant, three happy students, and less stress in the upcoming weeks. Completion times are a bear. In honor of my great mentor Jean Williams, I am swearing off clocks, calendars, and completion times for this week. Next week might be a different story. It doesn't get any better than that life. Well, perhaps I could be out climbing. All kidding aside, I decided to push off any hypoxic training until next week to ensure that I finish off this 15-week cycle with the strongest aerobic conditioning base possible. IHT does not affect my training. Hypoxic training, on the other hand, cuts down on the intensity and, as a result, slowly whittles away at my conditioning. I am too far out from my climb to start deconditioning. I have several comments about the figure below. My sleep quality improved because I am finally acclimatized to the tropics. I hate the heat but somehow my body got accustomed to the heat (80+ degrees) and humidity (almost raining in the tent). The increase in resting heart rate from late October through early November reflects how much my body was battling some bug. Despite the naysayers who claim resting heart rate does not accurately reflect recovery and stress response, I can tell you that it provides a strong signal for me. Any increase in oxygen saturation shown in the figure below reflects the tentless nights. I saw almost no changes in my post-tent nights spO2 - always in the low to mid-90s. We are finally acclimatized to 9,000 feet. I have several people to thank this week. There are countless others but these are the only ones that come to mind while I write this post. I have many more weeks ahead to thank the rest of you. Thanks to Brownie Schoene and Ralph Bovard who supported me and my grant proposal. Both of these guys are physicians and Everest veterans. Ralph is a pal from graduate school. He and I met at lunchtime most days to train outdoors in the sunny Tucson weather. Ralph introduced me to Brownie before my Denali climb. These guys have been so supportive. Guys, I hope we get the funding and even if we do not, I hope we find some projects to work on in the near future. Thanks to Michelle and Quentin Plaut - two neighbors of ours in Fairfax. Michelle follows my blog along with her classes at Flint Hill School in Oakton, VA. I hope you enjoy the posts class. If you and your class have the time, I would be happy to visit the school before I push off in April. Thanks to Kevin and Caroline Hilton again for throwing an awesome party. Also, thanks for introducing me to some great people. The character of a person often gets reflected in the friends they keep; I do not include myself in that honor circle but aspire to get there. You guys are fantastic. Speaking of the Hilton party, thanks to Paul Schriefer for a motivating conversation. I'm sure we will get out for a few open-water swims soon (post climb)….provided you promise not to bury me in your wake. Finally, thanks to my family - Kathy and Patrick - for putting up with me during one of the most tumultuous weeks I can recall. You two are my rocks.